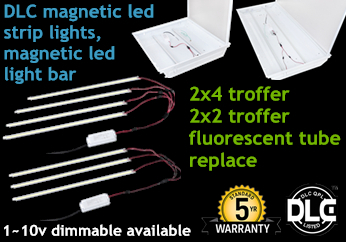 LED Linear Troffer Retrofit Kits Strips are economic LED replacements for 1’x4’, 2'x2' and 2'x4' existing recessed troffers in drop-in ceilings. The kits are easily and quick field installed using simple hand tools with minimum modification to the existing housings. 2> Lumen Efficiency:125-130Lm/W DLC Luminaire. 3> Power Factor: > 0.95. 6> Mounting method: Magnetic led strips and driver, quick-connect,fast installation. 7> Replacements: Retrofit 2’ x 2’, 1’ x 4’, and 2’ x 4’ “troffer” or fluorescent tube style fixtures. 8> 1-10V dimmable, emergency back up version are available. Yes, we have our own factory, so we could offer magnetic led light bar with competitive prices! human being, we would offer you the free lamp parts or new lamps!